Not quite as successful as in recent years, this year’s Northampton Head saw us come away with just two wins. These were for the Women’s IM3 4+ boat and a Mixed IM3 2x- crew. The relative lack of wins was, I think, down to a combination of a higher standard of competition (both quantity and quality) and a smaller MKRC entry than usual.Some interesting combinations entered and nice to get a Men’s Eight out again. Going for time only (no competition at this category), the four of Paula, Lou, Karen and Clare, coxed by Liz, posted a good time of 7:33 to put down a marker for their “real” race later in the day. Pierre-Yves and Tim racing together again, first time out in a double for some time. Their opposition took a big lump out of them off the start but the guys then managed to hold them for the rest of the course. Considering their opponents include a Nat Masters winner, a creditable performance. A new combination saw Jo and Andi racing (possibly rowing?) a double for the first time. Given lack of practise together (and Jo not having been in a boat at all for months) their stated aim was to finish the right way up and the right way round! They did this easily and actually pulled away from the crew chasing them. Steve and I knew this was going to be a tough race, being drawn as a sandwich between Abingdon and Nemesis, both of whom have beaten us by some distance in the past. Nemesis put in a very strong and quick start, pulling back probably a couple of lengths in the first 200m but a detour into the bank dropped them back again. We were really pleased as we then sat on them all the way down the course, even pulling away a bit in the closing stages. Ultimately we were 2 seconds slower than them (and a further 5 seconds off of Abingdon) but this is much closed than we’ve ever been before, so real progress. Really nice to be able to put out a men’s eight again. Originally planned as an IM3 boat, the lack of competition in this category led to a quick rejig (jettisoning Josh as he’s too young) and entry as Master’s B. More of a practise run than a race, we’d not rowed in this combination before and certainly Steve, Pierre-Yves and I found it odd having just one blade. Despite this, we settled fairly quickly and were beginning to move the boat well. I’d noticed that my seat was making more creaking noises than usual and after about 500m it started sticking intermittently; then with about 500m to go it jammed completely throwing me backwards off the seat on the drive. I finished the race sitting at backstops, my seat in front of me, rowing arms only. As we got out, the reason for the problem became clear as one of the seat runner wheels was laying on the decking… Still, up to my malfunction it had been going really nicely. Another new combination saw Josh and Andi doubling for the first time. As we had the only two boats in this category, we were guaranteed a win, so it was down to inter-club rivalry. Although they have limited racing experience in sculls, the two of them looked strong and would be a good bet in Novice (they were rowing up as no competition at Novice). Our usual boat out again, racing against Abingdon and Canterbury Pilgrims. We seemed to take a while to settle (could be the lack of water time over the past two months?) but did finally find our rhythm. The exertions for Steve, Pierre-Yves and I over two previous races showed towards the end though and we weren’t really able to push hard in the finishing straight. A scratch crew of James, Benn, Nelson and Josh (yet again coxed by the admirable Liz) really gelled and put in a very strong row, managing to keep our quad at bay for the entire course. Again rowing up a level against school crews, they were unlikely to win the event but this boat looks like it could be very competitive over this year. Our second crew in this category saw Tim and Jo sculling together in yet another new combination. Their greater expertise paid off and they beat Josh and Andi by around seven seconds (despite heckling from the bank during the race – Andi helpfully shouting to them that they were going the wrong way). Despite the bitterly cold temperatures and biting wind, another great day at Northampton Head. Maybe not as successful as other years but some good performances and nice to get a Men’s Eight out again. Definitely seemed to be more crews and a higher standard this year, wonder if the bad weather has meant more people looking to get in an early race? Whatever the reason, good to see Northampton getting more support, which they thoroughly deserve for such a well organised, friendly event. Even the waiting for late boating crews didn’t seem as bad this year. Must sign off now though as we’ve got to go and wash just about everything we own; that bright yellow sandy mud from the car park gets everywhere and into everything! 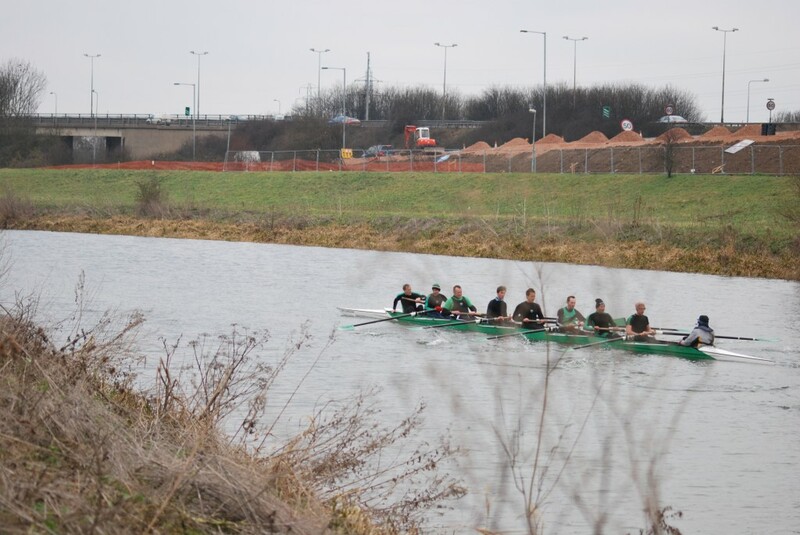 The first race of the year at a cold, cold Northampton saw us come away with four wins for the club. There were other really good races as well from other crews, so a promising start to the year. We put in a good number of crews, especially from the ladies squad, showing the growing strength in depth. This also saw another four new rowers make their MKRC début – including a winning start for Ashling. First time out for three of this crew, who only just scraped into IM3 despite having three novices in the boat. Tim provided the experience (and the points) but a good row from the new guys saw a creditable time on their racing début. Despite having eight points (regressed! ), Tim has no sculling points at all and this was his first race in a single. He accomplished his primary aim (finishing upright and dry) and actually posted a good time, despite a close encounter with the bank. Plenty more to come, was his view, as he gains experience. Despite a strong looking opposing crew from Canterbury Pilgrims, we pulled out probably our best race to date to win this event. A nice, powerful and controlled race actually saw us post the fastest time in the division, including being faster than an eight! All credit to Simon, picking up his first win. First race for Ashling and only the second event for Frances and Andi but the practise and coaching paid off as they took the win in this category, beating their opposition by over a minute! Lou made up the crew and this looks to be a promising combination for the season ahead. Although Northampton isn’t one of the “big” events, it IS friendly and well organised and one of our “must do” races. It’s a good starter for the year with less pressure and a nice bit of river. Somehow they always conjure up the same weather as well – brilliant blue sky but bitterly cold (my toes have only just thawed out). I guess the only suggestion would be to get the eights boated first in each division as we always seem to wind up sitting for ages in the cold waiting for an eight to wend it’s way down. It was really nice to see four new faces in their first events, and all seemed to “enjoy” their first taste of racing. Personally very pleasing to come away from an event with two wins as well. A good way to spend a Saturday! So, to the first event of the New Year. Another good day out for us at Northampton, with the club taking three wins out of seven boats entered. Update: Shows nobody reads this – we actually won FOUR events!! I missed the Mens S3 4+ crew off – sorry guys. As usual, the event was friendly and boating really well managed – some problems with Division 2 being delayed but this was down to certain crews boating way too late. The “shoe boxes” were a great idea – full marks to whoever thought that one up. Division 1 started off in nice calm conditions, bright sunshine although very cold. The flat water led to some good rows, with the three winning boats all coming in this division. These were the S3 4x-, the WS3 4+ and, on their first competitive outing, the “handicapped pair” as they were referred to by race control (Paul and Nick in the S3 2-). By the time Division 2 got underway, the wind had picked up and the river was getting pretty choppy. In this division we had two more women’s fours, one at S3 the other at S4. The S3 boat went off, followed immediately by the S4 crew. The two crews chased each other down the course, with the (younger) S4 boat finally overtaking the S3 ladies after 1200m or so. This despite the great line taken by the outstanding cox in the S3 boat (OK, it was me…). Only one crew in Division 3, the Men’s S3 4+ boat. For a scratch crew, the performance was pretty good and opens up other possibilities for the rest of the season. And they won! The Fourth and final division again saw two boats out. These were the Women’s S4 4x- (another scratch crew) and Steve and I in the Vet D 2x-. The Ladies quad went well (better than they expected) but I think the lack of water time caught up with Steve and I (certainly with me!) and our row was disappointing, being overhauled by the following Vet E boat (who had a 13 second handicap advantage) for Guildford. Having seen the results though, it wasn’t quite so bad. Some good results and performances with some new combinations out. Nice to see another debut today as well, with Lou in her first race in the second WS3 4+ crew.